Last October I had the opportunity to go to England and Ireland and the trip changed my life. 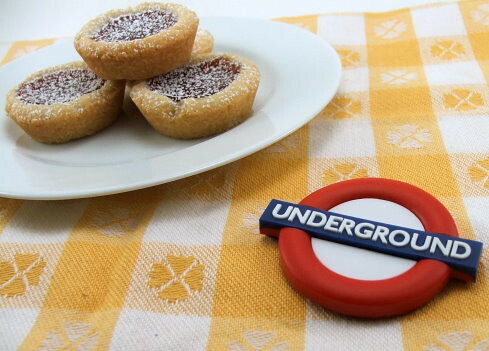 Overall, I must admit, the food was pretty bleak. 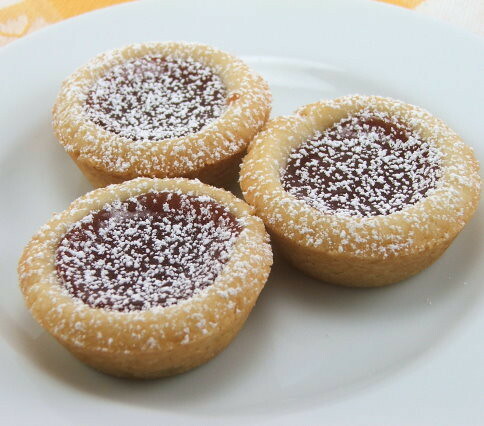 I was so busy preparing for my friend’s wedding (in which I was not only the Matron of Honor but I was the cake designer) that I ate a lot of quick meals and pub food. 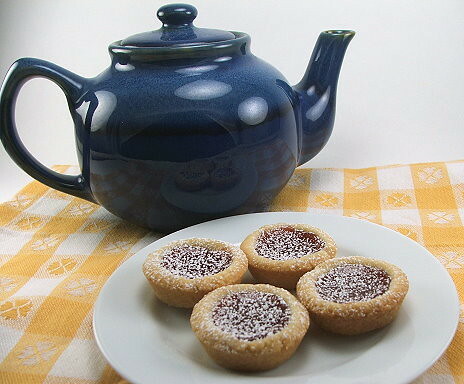 However, one lovely afternoon I had a traditional tea, and with that tea came some buttery, slightly sweet, jam tarts. 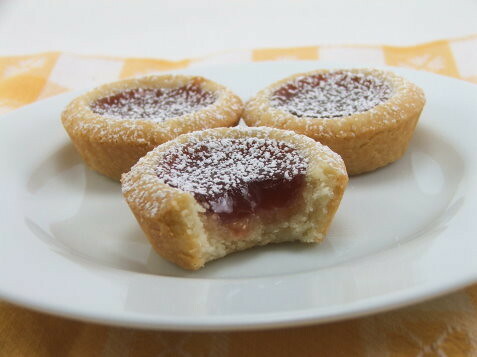 Those little jam tarts, and Irish Soda Bread (recipe to come in the weeks ahead), were the two things I came back craving. 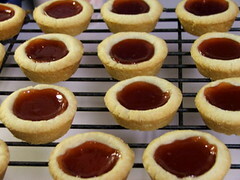 So, I set about making a serviceable jam tart. 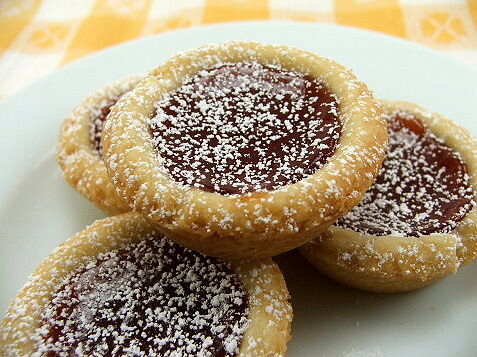 What I ended up with is better than what I remember. 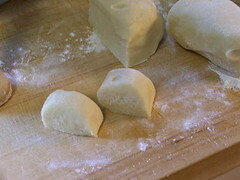 Using a modified version of the dough from my Almond and Chocolate Filled Butter Cookies I gave them a whirl. 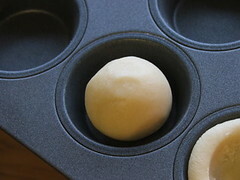 Heat your oven to 350F and have ready an ungreased mini-muffin or mini-tart pan. 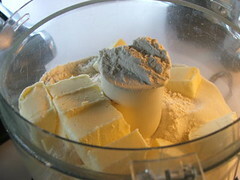 In the bowl of a food processor combine the flour, sugar, milk, vanilla, and butter. 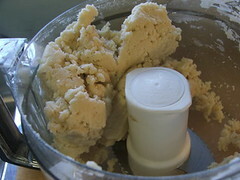 Pulse until the mixture forms a ball. 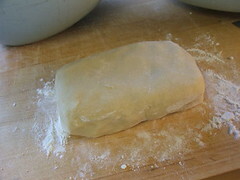 Turn the dough out into a floured board and form into a log. 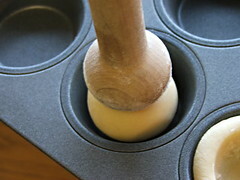 Divide the log in half and divide each half into 15 pieces. 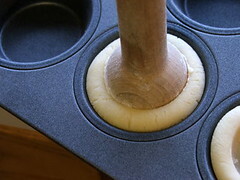 Place a ball of dough in the cup of a mini-muffin pan and, using a dough tamper or your fingers, press down until the dough reaches the top if the cup. 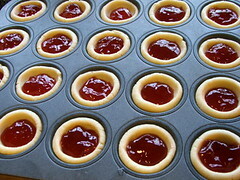 Spoon about one tablespoon of jam into each tart shell, making sure the tart shells are not too full. 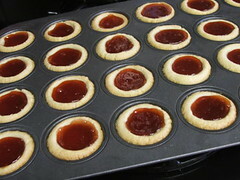 Bake for 25 to 30 minutes, or until the tarts are golden brown and the jam is bubbling. 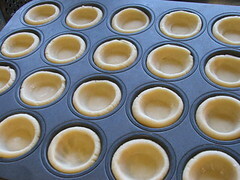 Cool in the pan for 30 minutes before removing to a rack to cool the rest of the way.